It had been a long time since my son, Shaun, and I were able to go on an adventure together. He had moved up to Portland, Oregon and his work schedule did not let him get down here to SoCal very often. So we made a plan when he did come down to take at least a day ride together. I had taken him out to Calico Ghost Town in my 4×4 to visit the town and surrounding area when he young so I planned a loop route from the Calico Ghost Town area east of Barstow, CA for our motorcycles that would visit several mining sites around the ghost town and visit the crash site of 2 military aircraft in the 60’s. We left before sunrise for the 2-½ hour drive to our starting point located on Mule Canyon Road. We got there as the sun was breaking over the mountains and started to unload. Shaun would be riding my licensed Honda XR600R and I would be on my licensed race bike a Husqvarna 250. 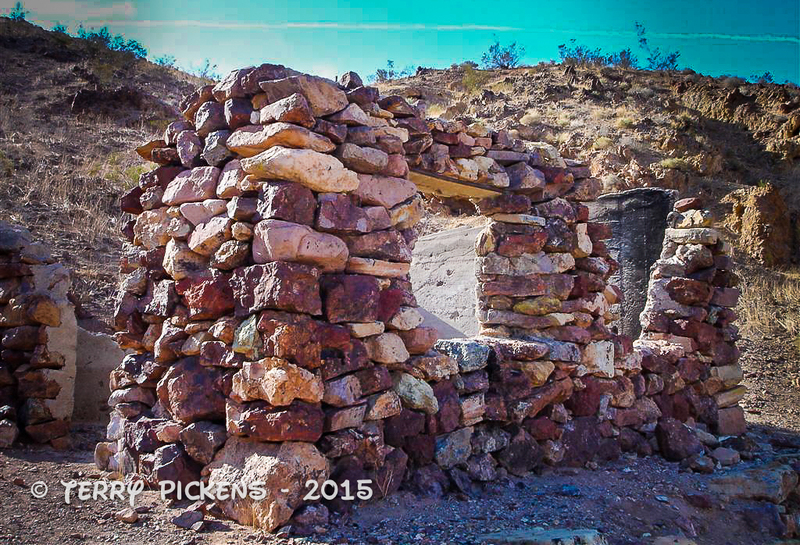 We get ready then head north up Mule Canyon Road to an old dump area called Tin Can Alley. Yes this is an old dumping ground for the miners in the area. 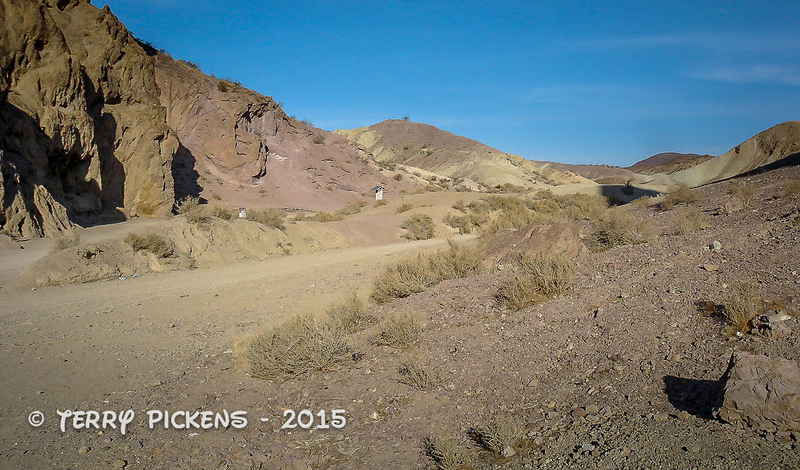 Circling Calico Ghost Town on desert roads we find many mining sites and an old stone cabin. Every time we stopped to take in the view there were mine tunnels and shafts everywhere. We continue on desert roads to paved Fort Irwin Road and start up dirt Copper City Road to weave our way through the valleys east of the road. We start east find an area we cannot legally go further and head north on the first road then west on a road in another canyon to head north then head east up yet again another canyon. In one of the canyons we find an old stone house that appears to still be in use by locals as a party house. It is all decked out inside with a small table, foodstuffs, seating, and a fireplace. I know it is a party house by some of the incidentals that were scatted around inside and out. In another canyons we find more mining equipment, shafts and tunnels. Now that we are finished in this area we head back toward Copper City Road and cross a dirt runway in the middle of nowhere. We head north to follow a short loop to get back to the planes crash site/ memorial. Going north on a published route, that I found in a 4-wheel drive book, we came upon a barbwire fence running east to west that went on forever. Looks like the military base has expanded a little bit and fenced off the area to us. No worries we head west along the fence road till we find the return trail from the loop and head back south to Copper City Road and our next stop. Back at the staging area of Copper City Road we wind our way on single-track trails to the crash sites. Yes there are actually 2 crash sites as the planes collided in midair and came down in different locations. “What was suppose to be a routine photo shoot turned to disaster. General Electric, the designer and manufacturer of the powerful engines of the XB-70, wanted a few promotional photographs featuring a “family photo” of the Air Force aircraft using GE engines. It was simple and perfectly reasonable request from a colossal supporter of the military. As the photo crew boarded their Learjet for the shoot, none aboard could have anticipated the outcome. Just after the last shot of the day was taken, a Lockheed/NASA F-104N, flown by NASA chief test pilot Joseph Walker, was sucked into the jet vortex of the giant XB-70. The F-104N flipped over onto the top of the massive bomber, clipped off the bombers left tail section and turned into the massive fireball. The crew of the Valkyrie, initially unaware of the collision, continued in straight and level flight for 16 seconds. However, the aircraft entered into a unrecoverable flat spin. The XB-70 continued down until it struck the desert floor. Al White ejected in the final few seconds, but unfortunately, Major Cross lost his life when the XB-70 impacted the ground.” (copied from http://www.check-six.com). Such a sad ending for 2 military pilots, the one cross bears Joseph Walkers wings and epoxied into the monument are parts of the plane. It was getting late so we headed back to Copper City Road and took Fort Irwin Road south till we hit a road heading west that would take us back to our truck. 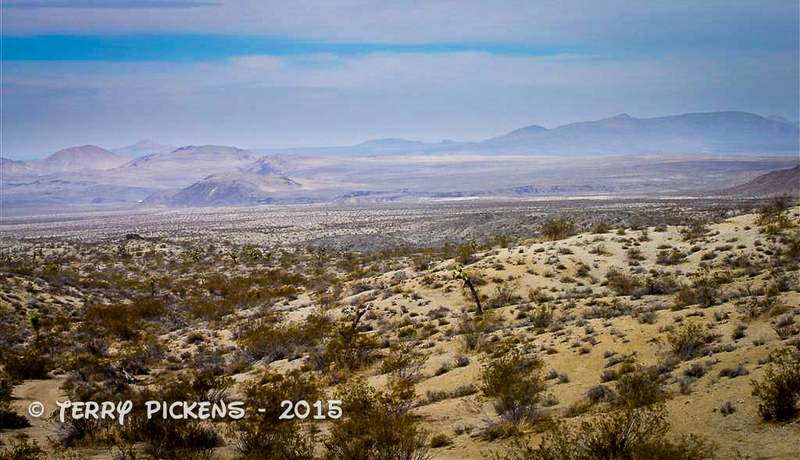 But we had a little side excursion first, up Doran Scenic Road east of Calico. 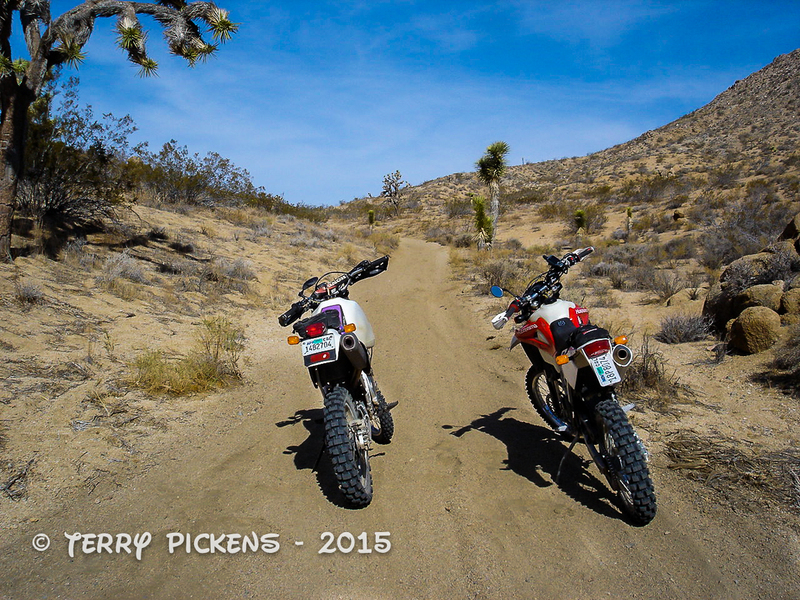 A small motorcycle trail winds between Doran and Mule Canyon so we thought we would try it. Well it was a slot canyon that just kept getting narrower and narrower, at some points not much wider than out handlebars. We stopped and both discussed if should we continue or return while we could still manage to turn around. It appeared we were close to the end but as the sun was setting and we had no idea where on the map we were we decided to turn around rather that get stuck in the canyon. It was still a fun ride even though we did not get to finish the slot canyon and finally got back to the truck tired but excited about the ride and all the sites we visited today. Just being together again doing what we both enjoyed was great. 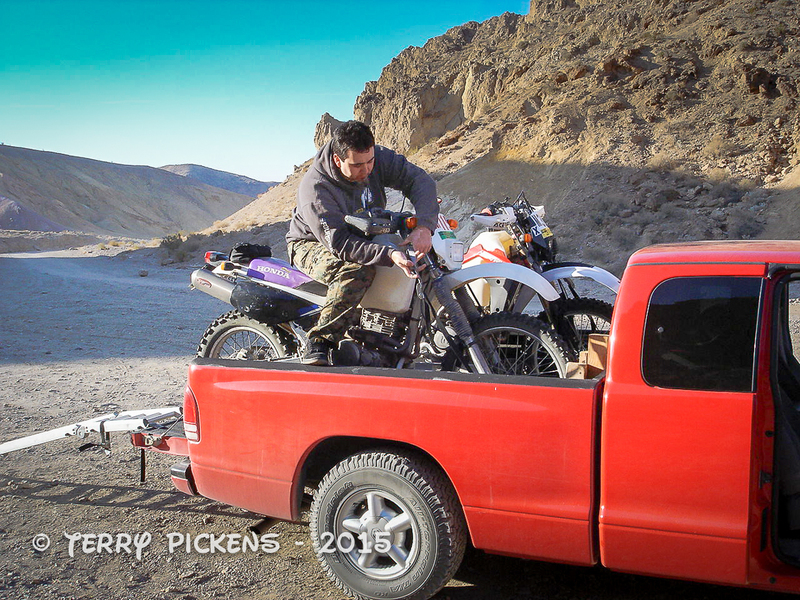 We loaded the bikes into the truck and headed out for our 2-½ hour drive back home and a well deserved rest. Everyone have a very Happy Easter. Well it’s been 3 years today since I lost my wife, Jodi, to a disease that haunted her throughout her life, Cystic Fibrosis. She was a person with a strong will and most always a smile on her face, ready to help others. She was as active as she could be and loved to ride motorcycles, ski, camp, hike, travel and of course enjoy the grandkids. I knew she was active in the CF community but I never knew how many lives she touched around the world until after her death. Even though I cannot see her with my eyes any more she will forever be in my heart.